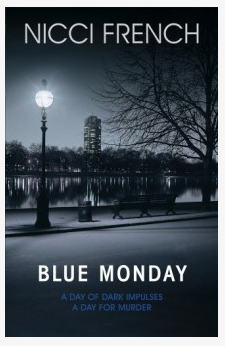 I’m not sure what to say about Blue Monday, it’s one of those books that just works, at least for me. The heroine, Dr Frieda Klein, is not a particularly sympathetic woman. She seems rather closed in, distant from the other characters in the book and distant from the reader. But the book doesn’t begin with Frieda, it begins 22 years ago with two little girls. In fourteen pages French, really authors Nicci Gerrard and Dean French, show the devastation of the family of a lost child. The guilt, shame, anger, grief. Fast forward then to present day and Frieda and a missing 5 yr old boy. At page 113 the characters begin to connect but the pace is still what I would call maddeningly leisurely. I wanted any number of times to put this book down but I simply couldn’t and I don’t know why. I didn’t like Frieda though she did once or twice show enough emotion to become interesting , I didn’t like Detective Chief Inspector Karlsson who seemed a little too fast to be rude and dismissive. The only two characters I did like, her niece and the Ukrainian contractor, were not central to the story. But still I couldn’t put this book down. The not attractive main characters, the slow pace, the lack of tension, all of this should have had me reaching for the next book on the pile and yet I just couldn’t. There was something that kept pulling me into the story and the end, while not tidy or particularly happy, was satisfactory. And I ordered the next book.